Perfectly Clear Window Washing provides an experienced house and deck washing service. We wash all kinds of houses, including cedar shingles, painted shingles, prefinished shingles, clapboards and vinyl siding. We use environmentally friendly cleaning materials which remove dirt, mildew and mold making your house sparkle like new. We are especially careful around plants, covering where possible, and making sure we cleanup carefully. We also clean decks. It very important to keep your deck cleaned and maintained, because repairing it can be extremely costly. 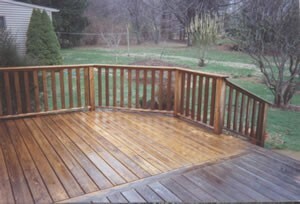 We recommend washing and inspecting the deck annually, and keeping some form of coating on the deck to weatherproof it. Please call to discuss and we can recommend the best weatherproofing for your deck to suit your budget and the look and feel you want. 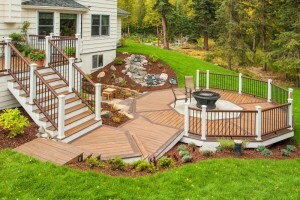 We can wash and clean any type of deck, including synthetic, composite materials. These synthetic materials are extremely low maintenance and do not split or splinter, but they do attract mold and mildew and require regular washing to prevent degradation. Once again, when washing your deck we will take care of any plants you have, clean and clear up the area before and after washing the deck and surrounding structures. 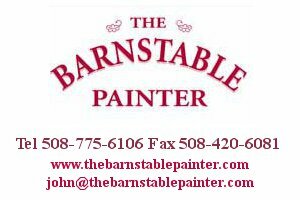 Please give us a call or complete the contact form and we’ll be pleased to come over and give you a free estimate and advise on any maintenance work we would recommend.